It could be an advertisement in a newspaper lonely hearts column. Debt-stricken airline would like to meet wealthy suitor to make life more bearable. Non smoker, good sense of humour definitely required. That seemed to be exactly what Biman Bangladesh Airlines was saying when it issued an advert for a "strategic partner" in the press on Tuesday. The airline is now so cash-strapped it is struggling to pay salaries and maintain its elderly fleet of aircraft. Biman's erratic passenger schedule, the poor state of its 13 elderly aircraft, its bloated staff numbers and its failure to pay fuel bills have all given the impression that it has hit severe turbulence. Analysts are saying that the "lonely hearts ad" which appeared in the country's national press on Tuesday is a last-ditch attempt by the airline to find an international partner. If none is found, many predict that the airline will fold. "If we get a suitable partner, Biman can come back to form," Managing Director Abdul Momen told reporters. "We have floated the international tender seeking a partner to run our business jointly. "From our side we need new cash funds, new aircraft and expertise to run Biman's operations. "We are in a very difficult position. We no longer have the ability and resources to run our business. Last month, we even struggled to pay monthly salary to our employees," he said. The airline's financial position is indeed dire, so any possible suitor will need a deep wallet and a fair amount of patience. 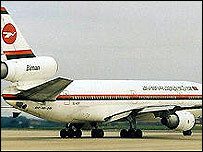 Five of Biman's aircraft which are currently being repaired abroad - two DC-10s, one Airbus and two Fokker F-28s - cannot be brought back to Dhaka because the airline does not have the money to pay the bills. Left with just eight aircraft, Biman has been forced to cut many of its 25 international flights, and officials have warned of further cuts to come. In May, Aviation Minister Fakhrul Islam Alamgir said that the airline underwent a loss of $80,000 on each flight to New York because of operating old DC-10 aircraft. In recent years Biman has been beset by corruption allegations, especially over aircraft-leasing, with government-appointed middlemen usually named as the beneficiaries. The airline's woes have been pinned by many observers on the government's reluctance to relinquish control of Biman and allow it to stand on its own feet. One report estimated that Biman pays every passenger it transports an average of $20 in compensation for delays. The government insists it is working to make Biman more efficient, and that the "strategic partner" initiative is intended to claw back losses which approached $42m last year. It is not a new strategy. 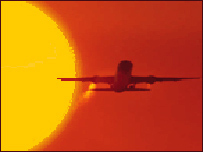 The aircraft issued its first "lonely-hearts ad" more than five years ago.